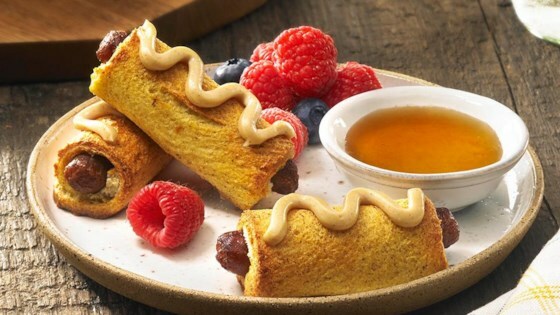 "Breakfast sausages are rolled in bread, dipped in vanilla-cinnamon egg mixture, baked and served with cinnamon-sugar cream cheese and maple syrup." Cook sausage according to package directions. In a bowl, combine the brown sugar and cinnamon; mix well. Add the eggs, milk and vanilla; whisk until combined. Using a rolling pin, roll out bread to flatten. Place one breakfast link on the edge of a bread slice; roll up jelly roll style. Dip in egg mixture to coat. Place on a greased baking sheet and sprinkle with cinnamon sugar. Bake for 15 to 20 minutes or until crisp and lightly browned. Place cream cheese in a resealable plastic bag. Cut the corner off and pipe cream cheese onto the top of each French Toast Sausage Stick. See how to make Italian sausage and penne pasta. For even easier preparation, use Johnsonville® Fully Cooked Breakfast Links and omit step 2. Try drizzling white icing or Nutella over French Toast Sausage Sticks.